Charanya of Yes I am Vegan passed me the award on 14th June. She is a professional blogger and teaches in 4 universities. She inspires with her Vegan recipes. Each post attracts with beautiful presentation and photography. Raw vegan energy bars from her blog I loved a lot. Vidya of Traditionallymodernfood passed the award on 24th June. She is my blogger friend and shares simple, traditional food in modern style, eye catching recipes. Her recipes are very helpful for the working women and I love all her recipes. I would say one such inspired recipe is her baked bonds. I always wanted to bake some battered vadas or bondas in my kitchen. Her post baked besan bonda inspired me and I tried to make them, which turned out well. 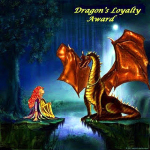 Posted on July 3, 2014, in Awards and tagged Dragons loyalty award, Wordpress awards. Bookmark the permalink. 22 Comments. Congrats chithra.. I think we share some common facts about ourself😃!! Congrats Chitra 🙂 Thank you very much for nominating me..
A big congrats chitra! You definitely deserve this award, as you are such a loyal bloggy follower of so many of us! Hope you feel encouraged! Thank you so much for nominating me! Means a lot!